Well, to be fair, that exact quote was probably never said, because ‘douchenozzle’ is much more modern slang. But if Downton Abbey can use ‘step on it’, I deserve the same leeway. We start off learning that barbarians and witch hunters detest each other and fight on sight. Also, elves and hobbits are never witch hunters, that pesky “Limitations Chart” earlier on notwithstanding. We also learn I like to fool around with the ‘torn page’ settings in SnagIt. We see the truly ‘old school’ three-point alignment system in play here, with Lawful, Neutral, and Chaotic, no hint of ‘good’ or ‘evil’ in sight. They have a very unusual magic system… in later games, this would have been modeled simply by giving them class abilities gained at various levels, but here, they’re semi-shoehorned into the spellcasting rules. Interestingly, the mana point system enables this nicely. You can give a class a small subset of spells, and the mana to cast them, and that’s that. Capped at 12 intelligence, 15 wisdom (for a clerical-type class? ), and nine charisma. Yeah. No axe to grind here, bucko! They get a ‘+5 with Lawful types’… I don’t know if that means ‘Add 5 to their capped number (9), so they max at 14’, or ‘Remember their original rolled number, and add 5 to that’. Almost certainly the former. The Witch Hunter is the only class in the core book to need two pages! Hey, These Guys Only Go To 40th Level! You will note these guys only go to 40th level. 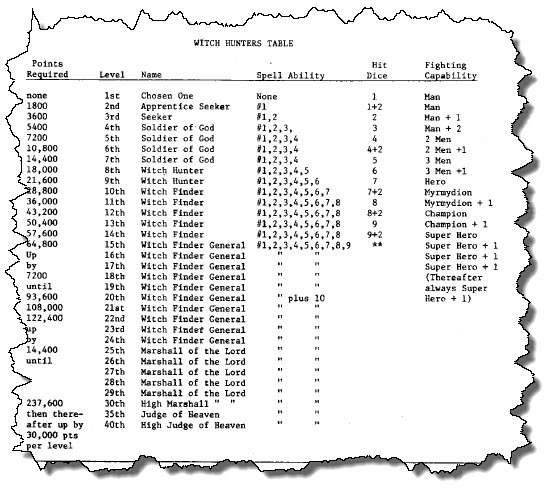 You will also note that, adding support to my thesis that the Grimoire was assembled piecemeal from documents written at various times, that the Witch Hunter uses the “Fighting Capability” rules from the very earliest edition of D&D, something dropped fairly quickly from common play… a holdover from the original Chainmail rules. We then get to a price list. I won’t be scanning it or going on in great detail, but there’s a few cool things to note. This includes price ranges, not fixed prices. A nice touch. There are ‘poison’ and ‘venom’ antidotes, by level. I have to assume that the simple ‘save or die’ poison rules that were part of D&D until 3.0 were widely replaced by others, because there’s a lot of more complex/less insta-kill poison rules out there. Adamantine grappling hook? 200 gp. Bronze crowbars break 30% of the time; Mithril, 5%. A “dhowrigged galisse” costs 40,000 to 75,000 GP. Doctor John’s Salve, which “heals heavy wounds”, costs 1,000 GP. Now, in two pages of teeny-tiny type, we have “Magic In Arduin” and “Even More Magic In Arduin”. Seriously, that’s how the text is broken up — not “Basic Rules” and “Advanced Rules”, or “Standard” and “Optional”. But, hey, it works! It always takes an hour to memorize all the spells of a given level, so if you can memorize 6 spells of that level, you spend 10 minutes per spell. This also means that if you know a lot of spell levels… and in Arduin, they go up to 11… actually, up to 30(! ), you could easily spend most of the day memorizing. Scrolls can only be used every other turn, due to the time needed to take them out, read them, etc. It ought to be noted here that while standard D&D rounds at the time were a minute long(! 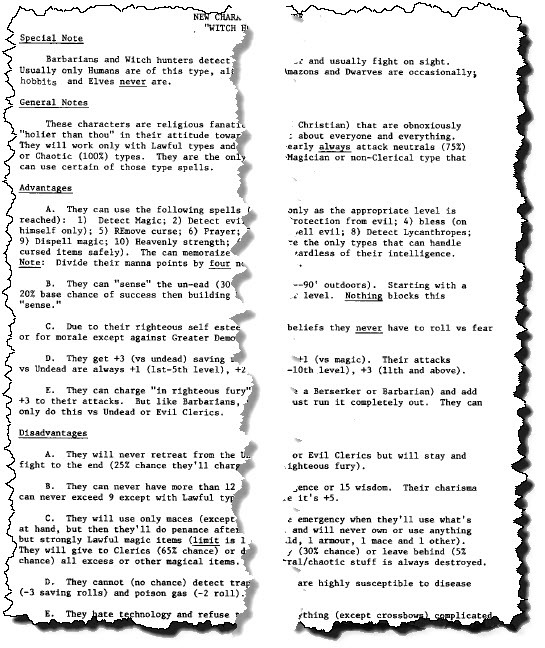 ), Arduin used the six second round, which became standard with D&D 3.0. once more, well ahead of their time. Also, if the mage is disturbed, his concentration will be broken, which could cause a backfire. There’s a lot of underlines in this text. The exact “heavy percentages of chance”, of course, are left up to the DM to decide. I begin with 100%, -10% for each potsticker or egg roll tossed my way. Then there’s this. I’m too lazy to type it in, so, here you go. The same rule applies to detecting magic — if you fail, you can’t try again for another level. (And in the modern age, Knowledge checks likewise need a level to try again… ). Wands, amulets, rings, etc., require conscious and conspicuous action to activate. Rings, in particular, must be turned — pity if the fighter is wearing his ring of flight under his armored gauntlet, the text notes with the sinister and sadistic glee only someone who has endured too much behind the screen can muster. This activity will be noticed and enemies will take appropriate action. Next up, we have yet another piece of “design prescience” — the invention of, in effect, Touch AC! For example, if you’re using a stasis compacted green slime grenade… yes, I said “stasis compacted green slime grenade”, it’s right there in the example… yeah, that is totally awesome, isn’t it?… you get a +4 bonus to attack, while, if using a cattle prod (yes, cattle prod), you only get a +2, since you must still close and attack. Makes sense to me! Throwing things, like a shrinking potion, you add +6, but you then roll to see what percentage of it hit your target… and what percentage hit your friends. Oops. Spelling in the Trilogy is often random; I’ll double check, but I’m sure both “manna” and “mana” are used, much like “Hobbit” and “Hobbitt”. I always assumed — maybe totally wrongly — that both words shared an etymology, that “manna”, food from heaven, was a source of power… but know I need to actually look it up and find out.